Summer Solstice is almost upon us and I am sitting here trying to think of ways I can celebrate it and pay homage to the dying Sun Gods. As we all know this is the time where the longest day of the year produces the most light. The Sun Gods will return to the Earth to be reborn again at Yule and be childlike and grow with the changing seasons. Maybe one day I can be standing in the middle of Stonehenge too to celebrate the turning of the year on this special Sabbatt with my fellow brothers and sisters! This would be so great! I hope that all the folks at Midsummers enjoyed their celebration with the Night Among the Fey! This is the time of year to leave offerings for the Fey and ask for harmony and balance. Which is also something I intend to do! I do wish I could have joined them but I had too many things going on but perhaps next year! Well I decided to do some research on the Sun god Lugh in Irish tradition and found out some very interesting things about Him. He is kind of the equivalent to Mercury in the Roman pantheon and Apollo in the Greek pantheon. Lugh was known as the God of skill and and the distribution of talent. 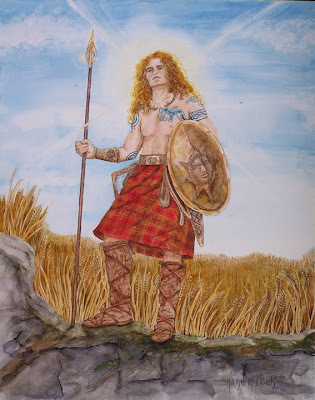 Lugh was considered a warrior because of his skill on the battle grounds. What I also learned about this God is that his name stands for 'oath', and he resides over contract making. He would be a good God to call upon if you are doing any 'oath taking'. There is one famous story that involves him arriving in Tara at the the hall of the high kings of Ireland so that he may join in on the festivities. A guard at the gate tells him that only one person will be admitted with a particular skill -- one blacksmith, one wheelwright, one poet, one bard, one sorcerer , one hero and the list goes on. Lugh tells the guard of all the great things he can do, and each time the guard says, "I can't let you in here because we already have someone who can do that." Finally Lugh tells the guard , "Ah, but do you have someone here who can do them ALL at once"? The guard could not argue with this logic and granted him entrance to the hall! Now traditionally speaking this God is celebrated at the time of the Harvest on August 1st since Lugh is honored with corn, grains, sheafs of wheat, bread, and other symbols of the harvest, but he has also been depicted in the Victorian Age as the God with Solar Energy. Most of his images depict him surrounded by Solar Light and one of his epitaphs in Irish Mythology in the known as the 'Shining One'! I think it would be equally appropriate to say a prayer to him during Summer Solstice and make an offering to him. He is also associated with the element Fire and since the Summer Solstice is about balance between Water and Fire again I think calling on him and paying your respects is appropriate. Or choose a stone with other properties you would like to draw from. Don't forget to make a fairy offering and libations to the Gods you call upon! One could also inscribe the Rune Sigil for the sun upon a stone in honor of the Sun Gods! Festivities to celebrate the Sun festival could include singing, dancing, archery, and poetry reading. One could watch the sun come up and merry make and eat a meal together with foods associated with the Sun. I hope everyone has a wonderful Summer Solstice!